In the manufacturing of tires, there are a lot of moving parts needed to run an efficient and productive operation. As a result, safety is of utmost importance to protect workers from machinery and other hazards. It’s also important to protect the equipment to avoid unnecessary repairs or replacements. 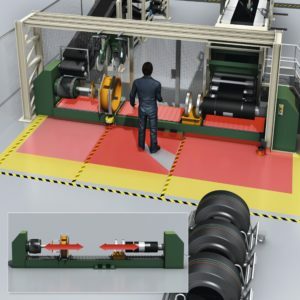 Manufacturers are also looking for ways to make the most of workers performing tire molding or turret tasks, but also keeping them protected. When proper safety is applied to a machine, hazards are reduced, resulting in increased productivity and overall performance. And SICK’s safety light curtains are the perfect solution to help tire manufacturers meet competitive demands and maintain safety standards. Continuous protection from machine parts: Tire production requires machines that have parts moving dynamically during operation. This can be a challenge to safeguard between moving components. The deTec4 implements a dynamic protective field widths that allow the light curtain sender and receiver to move closer together or further apart without having to change distance parameters. The settings can be changed based on how far the machine components are moving in the application (low, medium, or high range). In addition, there is no need to power cycle or configure with sotware. Eliminate nuisance tripping: With smart presence detection, the deTec4 enables guest units to be in sleep mode until the host is infringed. In addition, reduced resolution enables you to ignore small objects floating into the protective field, including steam, dust or tire particles in the air. This means you’ll be able to eliminate nuisance tripping incidents. Stay competitive in your industry and implement SICK’s deTec4 safety light curtains for maximum productivity and safety.